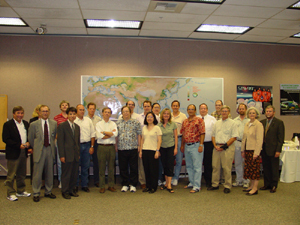 Twenty-three members of the SRTM Ground Data Processing System Team were recognized by nga at a ceremony on September 12 at JPL. Individual awards for each of the Processing Team members were presented by Bobbi Lenczowski, NGA, Technical Executive, and Tom Hennig, nga Special Assistant to NASA [CURRENTLY], NGA SRTM Program Manager [PREVIOUSLY]. Over 14,000 one-degree by one-degree height and image data products over the Earth were delivered to NGA on schedule and analyses by both NGA and JPL indicate the performance well exceeds the mission performance accuracy specification. The awards were signed by James R. Clapper, Jr., Lieutenant General, USAF (Ret. ), Director, National Geospatial-Intelligence Agency . Included with the awards were a banner that was flown on the shuttle, a NGA decal and a commemorative coin. 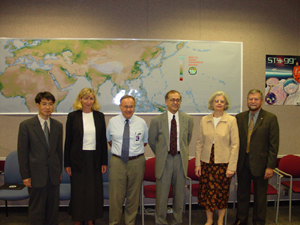 JPL management in attendance were Charles Elachi (Director, JPL), Diane Evans (Director for Earth Science and Technology Directorate), Charies Yamarone (Deputy Director for ESTD), Yunjin Kim (SRTM Project Manager), and Soren Madsen. Those receiving awards were: Yunjin Kim, David Perz, Paul Rosen, Scott Hensley, Ernesto Rodriguez, Jan Martin, Eric Gurrola, Joanne Shimada, Brian Swift, David Imel, Mike Papin, Mark Tarbell, Theresa Wright, James Cowan, Peter Kroger, Charles Morris, Mathew Yeates, John Eric Belz, Leland Bunker, Elayne Brown, Joe Reymann, Joseph Kwan, and Lori Udovich.